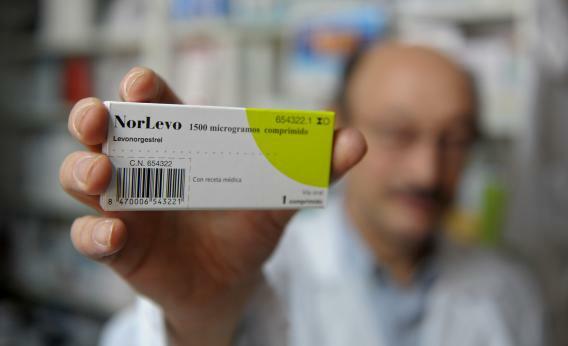 A pharmacist shows a box containing a ‘morning-after pill’ in a pharmacy on September 27, 2009 in Madrid, Spain. The best riposte to the new HHS regulations on contraception and religious organizations comes, no surprise, from Yuval Levin. Basically, the religious institutions are required by the government to give their workers an insurer and that insurer is required by the government to give those workers abortive and contraceptive coverage, but somehow these religious employers are supposed to imagine that they’re not giving their workers access to abortive and contraceptive coverage. If religious people thought about their religious obligations the way HHS lawyers think about the law, this might just work. But they don’t. But it’s the lawyers, not the peons, that the White House worries about. Having lost their Waterloo on health care last year, some conservatives are convinced that they can win lawsuits against the contraceptive rule, kick it up to higher courts, and dismantle the rest of the mandate. Continually changing the strictures seems like a clever way of preventing that.